George Repp was part of the fourth generation of Repp's born in Norka, Russia (January 28, 1886). His parents are Konrad Repp (born April 16, 1857 in Norka) and Anna Maria Weidenkeller (born May 23, 1856 in Norka). George's grandparents are Peter Repp (born 1828) and Elisabeth Döring (born 1832). George's great-grandparent's are Peter Repp (born 1787) and Anna Elisabeth Eusel (born 1782), George's great-great grandparent's are Johann Conrad Repp (born 1755) and Anna Elisabeth Yost (born 1760). In the 1760's, the Repp family emigrated from the County of Isenburg (which is now part of the modern day state of Hesse, Germany). Margaretha Repp along with her son, Johann Conrad, and daughter, Anna Maria, were founders of the colony of Norka in August 1767. Margaretha's husband probably died during the sea journey from Luebeck to Oranienbaum, Russia (near St. Petersburg) since she is shown as a widow on the arrival lists when their ship,The Elephant, arrived on August 9, 1766. George was five months old when his parents immigrated to the United States. They departed Europe from Hamburg, Germany and arrived in New York on the SS Suevia on July 1, 1886. The family initially settled in Hastings, Nebraska where Konrad found work with the Union Pacific Railroad. 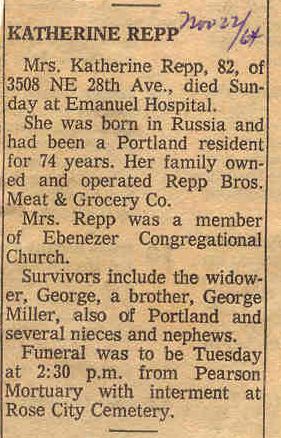 About 1890, the Repp family migrated westward to Portland, Oregon where they lived with Konrad's mother, Elisabeth Repp. 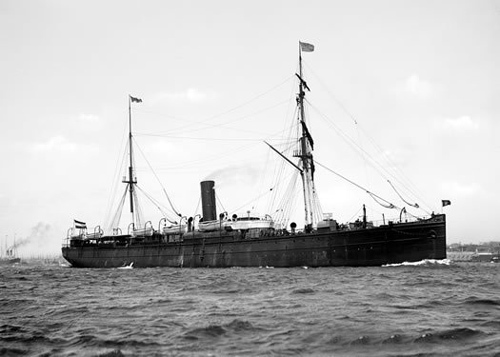 The steamship Suevia that carried the Repp family from Hamburg to New York in 1886. On February 1, 1899, just nine years after the family's arrival in Portland, Konrad Repp had saved enough money to buy a store with grocery stock at 760 Union Avenue North, at the intersection with Beech Street. Konrad's family had grown to four children with the birth of Paulina (born 1889 in Nebraska), Adam (born 1892 in Portland) and Lena (born 1895 in Oregon). On June 3, 1905, George married Katharine Miller. Katherine was born August 29, 1882 in Norka and her family immigrated to the United States in 1887. Katherine (Katy) was the sister of John W. Miller, who would become the President of the Volga Relief Society in Portland. Katy's parents were John and Alice Miller. 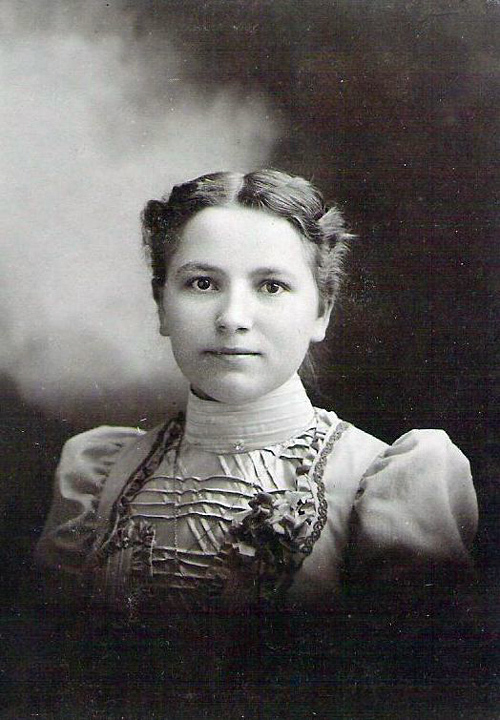 Photograph of Katherine "Katie" Miller taken in Portland, Oregon in 1898. George's sister, Pauline, married John H. Sinner on January 1, 1908. For a number of year's the grocery store was named Repp and Sinner Grocery. Konrad Repp died on August 13, 1916 and the operation of the grocery store passed to his sons, George and Adam. 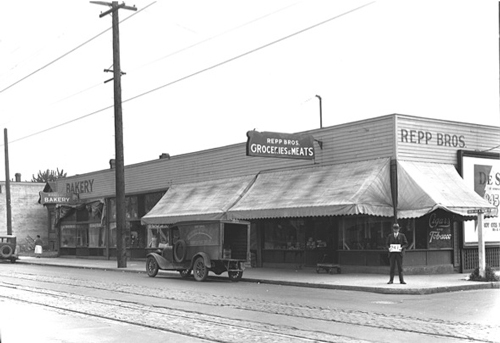 The grocery business was renamed Repp Brothers Grocery and Meats. The store was relocated to NE Union and Failing (northeast corner) and remained in business until 1970. Groceries could be bought on credit in the winter and the bill paid during the summer after farm workers were paid for berry, hop, and bean picking. Repp Brothers Groceries and Meats on NE Union and Failing Street. George was an active participate in the Portland Council of Churches and is reported to be one of the leaders of a fund raising effort in May 1928 according to an article published in The Oregonian. "My brother Walter had an even closer relationship with the Repp's because he lived at their house from 1919 - 1920 when he was in the sixth grade. Walter helped deliver meat after school, and on Saturday night he would share in the weekly treat of a quart of ice cream for the delivery boys. (To make sure nobody got cheated, every dish was carefully weighed on a scale!) For the first time in his life Walter owned a dog and was able to have the "man to man" talks with his uncle that every growing boy needs. He respected Uncle George's judgement, and for the rest of his life he looked back at this year in Portland as having had a very beneficial influence on the formation of his character. Between the years of 1924 - 1933 my sister Ruth, Walter and I had a special reason for being grateful to the Repps. They were the ones who loaned us the money without which we could not have gone to college." The Repp family lived near their store on Union Avenue but also enjoyed spending time at their second home at DeLake near Lincoln City on the Oregon coast. The cottage was owned jointly by George and Adam and was built by fellow Portlander, John Yost. In 1939, George sold his interest in the store to his nephew, Earl George Repp, the son of Adam Repp. In 1969, The Oregonian reports that the store was closed. Closure notice provided courtesy of Vickie Willman Burns. George's wife, Katherine died on November 22, 1964 and George died on September 14, 1965. George and Katherine are both buried at the Rose City Cemetery on NE Fremont in Portland. 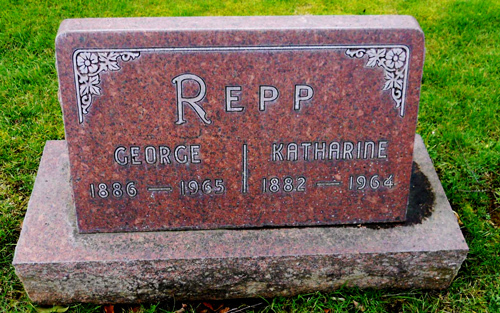 George and Katherine Repp burial site at the Rose City Cemetery in Portland, Oregon. The following recollections about George Repp were provided by Emma Erdman. Emma was born February 14, 1910 in Grimm, Russia. Her parents Jacob Erdman, Sr. (born March 17, 1882 in Grimm) and Molly Velte (born July 13, 1885 in Grimm) were married on April 13, 1908. The Erdman's also had a son, Alexander, who was born January 2, 1913 in Grimm. The Erdman's were members of St. Paul's Evangelical and Reformed Church. Emma Erdman's recollections were recorded in writing on November 16, 1984 in Portland, Oregon. "During the terrible revolution that happened after Mom and Dad were in this country, letters seldom came through. When they did, the news was always very sad. Everything was taken from them by the Communists. They were starving. We had to wonder how they could afford to write a letter. Some letters cam with several sheets of postage attached. Some of these stamps I still have, but doubt they have any value. My World Book says [Herbert] Hoover was President from 1929 to 1933, but the following seems to have happened earlier. It might have been started before he was President. The Communists were still starving and killing the people. Some were forced to dig their own graves, stand in them, and be shot to death by them. The Germans here and all across the country sent food and food drafts and money, to help their starving relatives. Very little was received by them. The Communists took most. 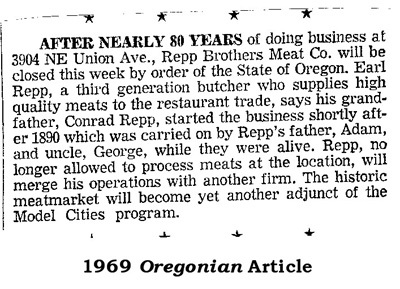 President Hoover, who at one time lived in Newberg, Ore., appointed George Repp, who had a grocery and meat market for many years on the corner of Union Avenue and Failing Street, and his brother-in-law, George Miller to go to Russia to feed the Germans. They they did for about 2 years with contributions from all the Germans from Russia here and across the country. All I remember now about this is when George Repp and George Miller came back home. Mrs. Repp lived in a big square house on Beech St. and Union Ave. one block south of their store. This house was decorated with greenery and a "Welcome Home" sign was on the door. There was a "Welcome Home" service at their church on NE 9th and Fremont [Zion Congregational Church] on a Sunday afternoon. I remember going to practice with girls from several of the German churches in the neighborhood, but when Sunday came, I was too bashful to march down the aisle singing. Each girl presented a rose to Mr. and Mrs. Repp, but I faintly remember being at the church. Take our thanks, thanks, thanks, for your kind service which you have rendered for dying children. Take our thank, thanks, thanks, for those children over there. Our God was with you. His grace has kept you through the great undertaking that confronted you. With hearts rejoycing, we praise His glory. May His blessing ever be your portion. The melody to this was sweet, melodious and very touching. Then I remember going to some of the meetings where these men told of their experiences. I also remember after all of this, Mr. Repp and President Hoover stayed good friends and celebrated their birthdays together. The Repp store was well known in the whole area for several generations. Everyone traded at their store. In those days, Adam Repp came to the house to take orders and then delivered the groceries in the afternoon. In the store, they stood behind the counters and took the groceries ordered off their shelves and wrapped them, usually with string." Correspondence with Robert Repp, grandson of Adam Repp.